He’s this generation’s greatest — and perhaps most complex — sports superstar. LeBron James is easy to love because he's so good at everything he tries, on and off the court. But sometimes it's just as easy to root against him, like when he alienates lesser teammates with his ego or shamelessly flops and draws fouls with more overacting than an Al Pacino movie. As "King James" battles our Dubs for the NBA title for the fourth consecutive year, it's natural for local fans to dislike the guy. He's the East Bay's biggest rival, after all. Me? I love LeBron. And, yeah, I kind of hate him, too. I think that describes the feelings of most Bay Area fans. Our reasons are as varied and complicated as the living legend himself. And maybe that's all right. Maybe as we root for our Warriors, we can also just enjoy LeBron's undeniable greatness while we still have him. If you love basketball or just enjoy watching a genius at work, then LeBron is your guy. Brilliant and one of a kind, he's the NBA's Picasso. And his artistic flair was on full display last week in Oakland, as he scored 51 points in a heartbreaking loss to the Warriors in Game One of the NBA Finals. LeBron mixed his freakish athleticism, high IQ, and natural leadership skills to nearly steal the win over the heavily favored Dubs. It was one of the greatest performances in an already storied career, and it left even his harshest critics breathless, wondering if they indeed were witnessing the NBA's greatest player ever. But King James' restrained anger after the controversial defeat led him to briefly flash a less admirable side, reminding everyone why he has detractors. He seethed over a disputed last-minute foul call, as well as the huge mental error committed by teammate J.R. Smith, who dribbled out the game's final seconds because he didn't know the score was tied. LeBron arrived at his postgame press conference in a huff, dressed in an eyebrow-raising designer shorts suit that can charitably be described as the J.R. Smith of fashion choices. LeBron gave abrupt answers and chastised reporters for asking what he considered poor questions. He prematurely ended the session by urging the media to "Be better tomorrow," then slowly put on sunglasses (even though he was indoors at around 9 p.m.), grabbed an expensive designer bag, and sauntered out of the tense press room — all while dressed like a rich man's Angus Young. The man who had wowed the sports world moments earlier with an awesome, mentally tough performance now was acting like a diva storming out of a Paris fashion show. Instead of bolstering his valid case that the refs had jobbed his team, the awkward scene led to thousands of snarky memes by the legion of amateur comedians on social media. Within mere minutes, the league's best player had appeared both fearsome and comically full of himself. Both performances that night illustrated why it's easy to both love and hate LeBron, this generation's greatest — and perhaps most complex — sports superstar. Like it or not, LeBron is synonymous with excellence, whether he's dominating NBA basketball, stealing scenes from a hit movie, or standing up to President Trump's racism. His drive and work ethic has fine-tuned an already supremely athletic body. He's rich and famous, sure, but also smart and charismatic. A decade from now, you could envision him running his own successful company, commandeering a board room as well as he does the Cavs' half-court offense. In Cleveland, LeBron is Superman. To Bay Area fans, who've feverishly rooted against the Cavs in the Finals for four consecutive seasons, he's akin to Marvel's biggest villains — someone you simultaneously respect, fear, and loathe. Except LeBron often seems more formidable than Thanos or Killmonger on even their nastiest days. In his 15 years in the NBA, he's proved he can do it all. LeBron, 33, scores with a bottomless repertoire of weapons. He's an excellent passer who makes his teammates better and he's the unquestioned leader of not just Cleveland's players, but of the entire franchise. And he's transformed himself today into what was unthinkable just five years ago: a plausible candidate to unseat Michael Jordan as basketball's greatest player of all time. Off the court, he's equally great. He's a devoted father and family man who married his high school sweetheart. He and wife Savannah have donated tens of millions of dollars to scholarships for kids in their hometown of Akron, Ohio. He also is one of pro sports' most intelligent and socially conscious stars. He's been unafraid to speak his mind on politics and social issues — something Jordan almost always avoided. When President Trump announced last fall the Warriors would not be invited to the White House because of Curry's comments about the visit, James wasted no time in defending his on-court rival. "You bum," James said to Trump in a tweet. "@StephenCurry30 already said he ain't going! So therefore ain't no invite. Going to White House was a great honor until you showed up!" His brave stance will only look better as the years go by. He's also proven himself as an actor, drawing strong reviews when hosting Saturday Night Live and stealing scenes from Amy Schumer's 2015 hit comedy Trainwreck. Next, he's slated to star in Space Jam 2, and the entertainment industry seems like a surefire post-retirement destination. Lastly, you can't help but admire LeBron's discipline and class. He has been considered a can't-miss phenom ever since childhood. Yet, he's never buckled under the weight of impossible expectations. He's never had brushes with the law or been embroiled in scandal. He's never embarrassed himself publicly (although that shorts-suit-and-designer-bag ensemble came darn close). Most of all he's wildly ambitious and competitive, showing time and again he'll do anything — and I mean anything — to help his team win. And yet, that is his biggest flaw. His endless drive to succeed recalls an old U2 lyric: "You can hold onto something so tight, you've already lost it." You can, indeed, want something too much. And when it comes to winning, LeBron is guilty as charged. Whereas Warriors coach Steve Kerr or Steph Curry often put on a clinic in taking a Zen, less-is-more approach, LeBron seems genuinely incapable of taking his foot off the gas. That might explain why LeBron burns out teammates and trolls his opponents nearly as often as he triumphs, showing a petty side that too often overshadows his success. When the Cavs overcame a 3-1 deficit to beat the Warriors for the 2016 NBA Championship, he made sure to wear an "Ultimate Warrior" T-shirt as he exited the team plane with trophy in hand. At his Halloween party months later, he served cookies that read "RIP Klay Thompson" and "RIP Steph Curry." Michael Jordan's zeal to win sometimes got the better of him, but he never engaged in these adolescent antics pulled by LeBron, acting more like a character from Mean Girls than Space Jam. LeBron's biggest mistake this year might have come in Game One, after Smith's big mental error. A video of the Cavs' huddle after regulation showed LeBron sitting a seat apart from others and pouting for more than two minutes. 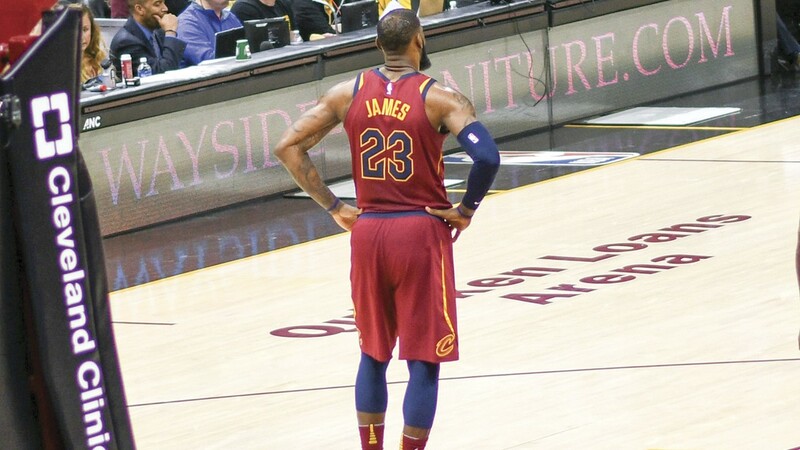 He ignored coaches and teammates and offered no encouragement to Smith, moments before they took the floor in the final minutes of a winnable NBA Finals game. It's no surprise the Dubs quickly notched a big lead in overtime and beat the suddenly listless Cavs by 10 points. It was a textbook failure of leadership. In a game where LeBron had great individual achievement, he failed as a floor general at his one job: to inspire the troops when they needed it most. If you rely on notoriously flighty J.R. Smith to win games, then part of your job is to have a plan ready to respond to the inevitable Smith gaffe. At the end of Game One, LeBron had none. And that was almost as costly to the Cavs as Smith's brain freeze. All of this might explain why Curry was able to recruit fellow superstar Kevin Durant to join him in Oakland, while LeBron was unable to prevent the equally talented Kyrie Irving from bolting Cleveland, reportedly so he could escape LeBron's controlling nature. The difference in ego between Curry and LeBron explains those two very different roster transactions, and the talent disparity those moves created between the Dubs and Cavs likely will decide the NBA Finals this week. In short, next time LeBron wants to say, "Be better tomorrow," perhaps he should be staring into a mirror. But there I go again, seeing the negative in LeBron when, really, there's so much to love. Truth is, he's a basketball genius doing exactly what he was born to do. I'm just going to appreciate the fact that we all can watch arguably the greatest player in the history of basketball at the peak of his powers. In the coming days, Curry, Durant, and Thompson seem set to bring another Warriors championship back home to Oakland. LeBron, meanwhile, likely will paint another hardwood masterpiece that will add to his legend.